You'll be £11.99 closer to your next £10.00 credit when you purchase Now the War is Over. What's this? How did Britain respond to the momentous events of 1919 and 1920 as it adjusted to peace after four years of war? What were the challenges the British people faced and how did they cope with the profound changes that confronted them? Now the War Is Over seeks to answer these questions. It looks at what happened in every sphere of life and it shows how, even today, we are still dealing with the consequences of those years of transition. Across Europe there were revolutions, a war for independence occurred in Ireland, and on mainland Britain there were widespread race riots. However, most servicemen simply wanted to come home to their families and a secure job. Some hoped for a return to the certainties of a pre-war world, but this was impossible too much had happened. As they explore the troubled state of Britain immediately after the war Simon Fowler and Daniel Weinbren give us a fascinating insight into how the global conflict changed the direction of the nation. For the first time in recent years this meticulously researched and highly readable tour de forcevhighlights and evaluates the political, social and economic impact of the Great War on Britain in the aftermath of the Armistice. 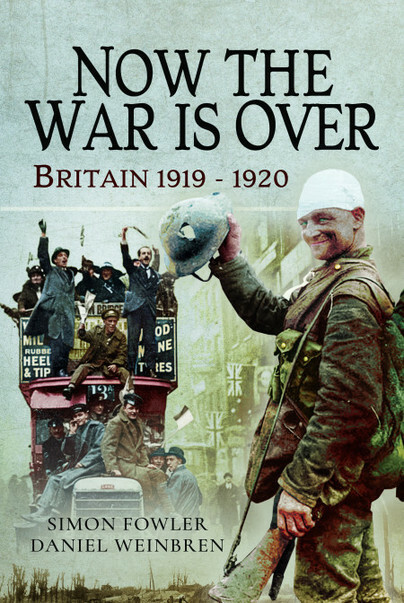 It is impossible to do full justice to this compelling account which this reviewer considers essential reading for anyone seeking to truly understand the impact and lasting legacy of the War on Britain. The book is based on hundreds of different sources, books, archives and websites. The text is fully annotated and supported by almost 40 pages of detailed footnotes. Most highly recommended.